The knob on the washing machine broke today. Well, it was the dryer, to be exact. We've lived in this house for fifteen years, and the washing machine/dryer set has lived with us for that entire time. They're hardworking appliances. That said, I can't see how four people could use a dryer so frequently in fifteen years (and gently, mind you) that the knob could break right off on a Sunday afternoon. We noticed that there is a crack in the connector between the knob and the port that holds it. My mother had the idea of switching it out with a knob beside it that we never use, so we took that one off. Lo and behold, that one had a crack as well! I think we've collectively turned this knob about five times in its entire life. What's my point to this whole shenanigan, you may ask? Well, it's a little something called planned obsolescence. People make big purchases on washing machines and household appliances in the hopes that they will last a lifetime. Lately, it seems that these appliances are being made to break after ten or twenty years so that you are forced to buy a new one. How in the world could a knob that is barely touched in its fifteen year life, be beginning to break nearly as badly as a knob that is used almost every day? Of course, with the introduction of 3D printers, we will soon be able to make replacement parts for our items when they break. Filament is pretty inexpensive, and there are even blueprints freely available online to make your own 3D printer with cheap parts from Home Depot. Or maybe you could borrow someone else's 3D printer to make the parts for your own! What an exciting time we live in now. Of course, the only missing piece of the puzzle is the file that contains the specs of the knob, which would be fed into the 3D printer. There's no way that Frigidaire, the company who made the dryer, would release such *covert information* as the specs of a knob for their dryer so that people could replace a broken one at home. There's just too much money in the six dollar-knob market. 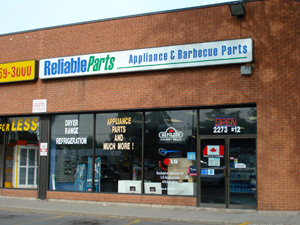 Yep, my dad went to Reliable Parts to replace the knobs and they were six frickin' dollars each. Almost $7.50 with tax, all said and done. And what did the sign in the window say? "Buy only real Frigidaire parts here!" Now you know why Frigidaire will never release the files for their precious fragile knobs. In the future, I would venture to guess that new appliance companies will appear on the market with 3D printer files as a selling point for their product. "Buy this dryer! If the knob breaks, here's the information to print a new one!" Not only does this save money, but it also saves resources. There is no longer any gap or overproduction between supply and demand. You can now supply your own demand, and nothing more. Will this happen in the realm of my lifetime? Most decidedly. What about my parents' lifetime? For their sanity, I hope so.